One of the French Restaurants that I’ve always wanted to try, but have not gotten the chance to visit until recently is Bistro Du Vin at Shaw Centre. 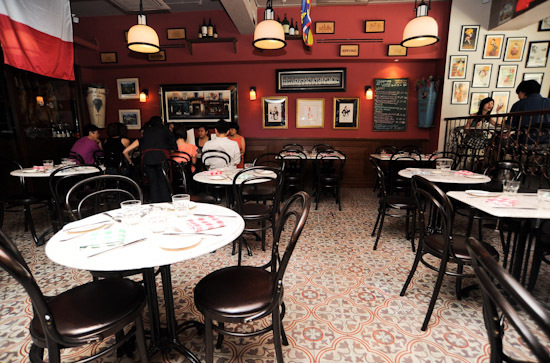 Bistro Du Vin by the Les Amis Group has been making a name for itself since opening in 2009. My friends have always raved about the classical French Food that they serve. I went there for lunch a while back and I have to say that the set lunch is absolutely a steal at $30++/pax. 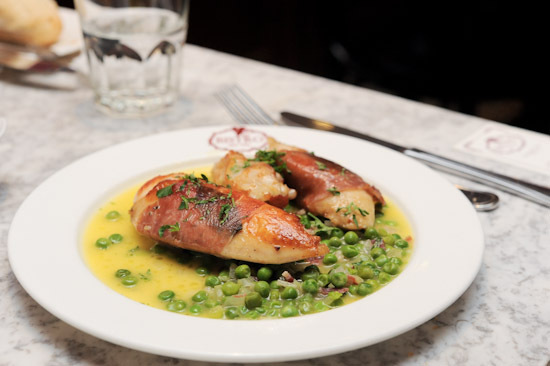 What I like about the three-course set lunch at Bistro Du Vin is the variety that they offer. It has six items each for appetisers, main courses and desserts. 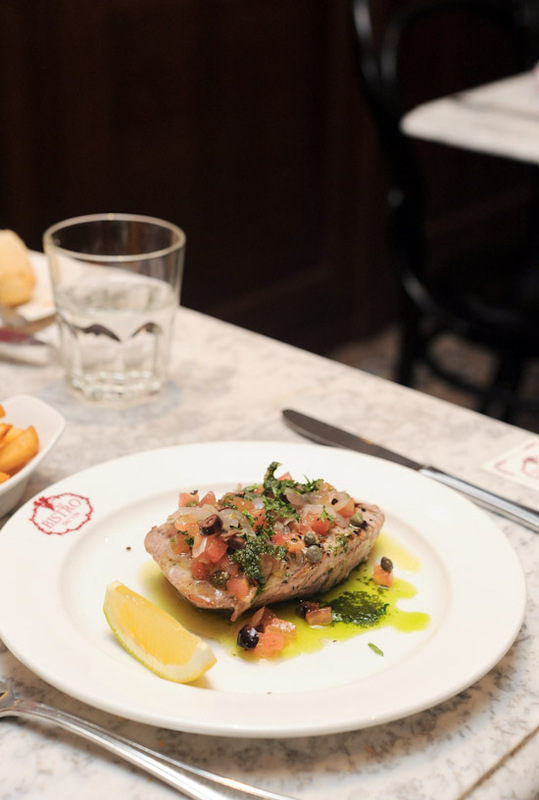 I am still saving up for the air ticket to Paris, so for now I can only satisfy my French food craving by eating at a French Bistro in Orchard road. After taking a glance at the menu, I immediately knew that there was no way I could resist the Pan-fried Foie Gras with prune compote (supplement of $6). I took a bite and I could feel happiness entering my body. The Foie Gras was good, but the scrambled eggs were even better. 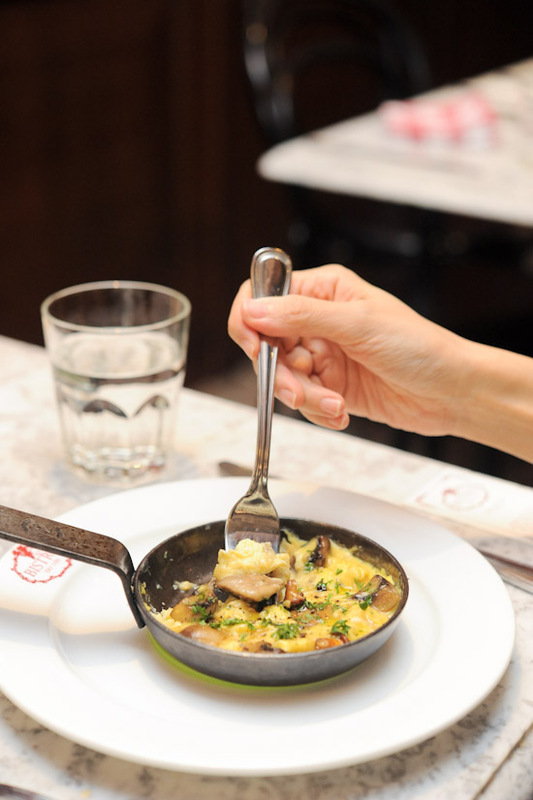 There is only one word to describe the Scrambled Eggs with mushroom & chorizo – scrumptious! I’d come back just for this (hopefully they don’t take it off the set lunch menu). Other appetisers include: Tuna and Lemon Pasta, Duck Rillette, Foie Gras Terrine, Escargot, and Tomato Soup. When we were there for lunch, the six main courses on the set menu were Chicken Leg, Roasted Pork Chop, French Duck Confit, Pan-fried fish of the day, Braised Oxtail, and Char-grilled US Angus Ribeye. There was also “blackboard specials” like the Roasted Spring Chicken, Braised Duck Leg, and Char-grilled Striploin. My dining companions had the Roasted Spring Chicken wrapped with ham and Fish of the day. Both were not too bad, but it was the French Fries ($3 side order) which stole the show. There was no truffle oil, or any secret ingredients – just really good French Fries. I had a hard time trying to decide between Char-grilled US Angus Ribeye (supplement of $10) and the French Duck Leg Confit. I eventually went for the latter. It was one of the better Duck Confits that I’ve had, and the portion was just right for a not-so-heavy lunch. For desserts, there was Creme Caramel, Dark Chocolate Mousse, Coconut and Passionfruit Sorbet, Warm Pear Tart, Profiteroles and selected cheese on the set lunch menu. We used the elimination method and chose three desserts. 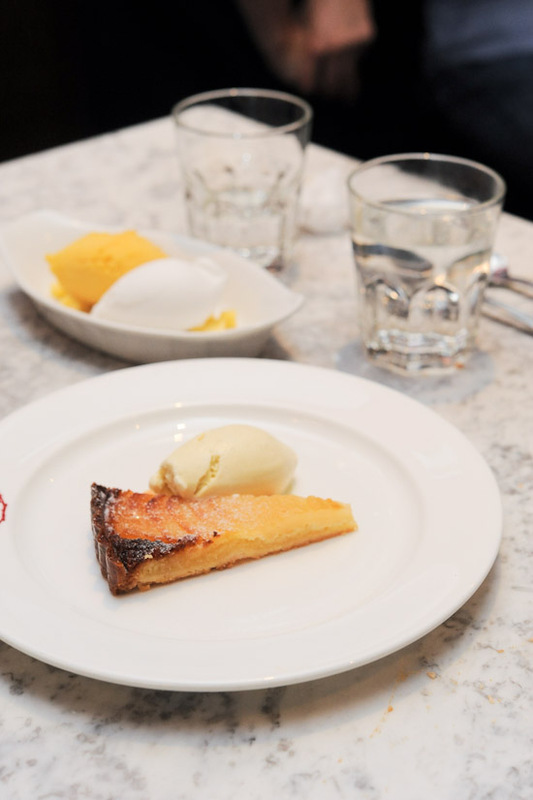 My favourite was the lovely Pear Tart with vanilla ice cream, while my friends found the pairing of Coconut and Passionfruit sorbet intriguing. 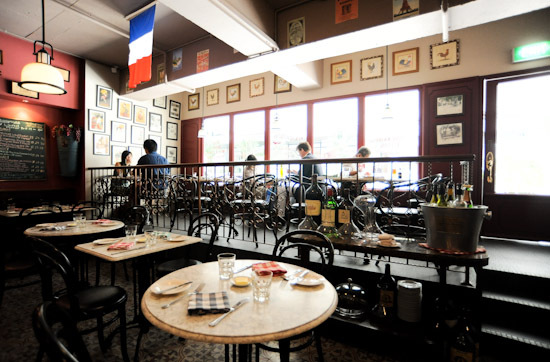 All in all, Bistro du vin by the Les Amis group serves a value for money 3-course set lunch at $30++. I will definitely come back again to try some of the classical French food like the Coq Au Vin and Pot Au Feu on the ala carte menu. Just wanted to find out if the set lunch is available daily or just on week days? @Mopeey the set lunch at bistro du vin is available daily. The pancakes on your blog’s header look very delicious! May I know where they were from? @Jeannette I had the pancakes from KU DE TA in Bali. OMG!What a food!These things just like a jewellery in my eyes! The secret’s out! 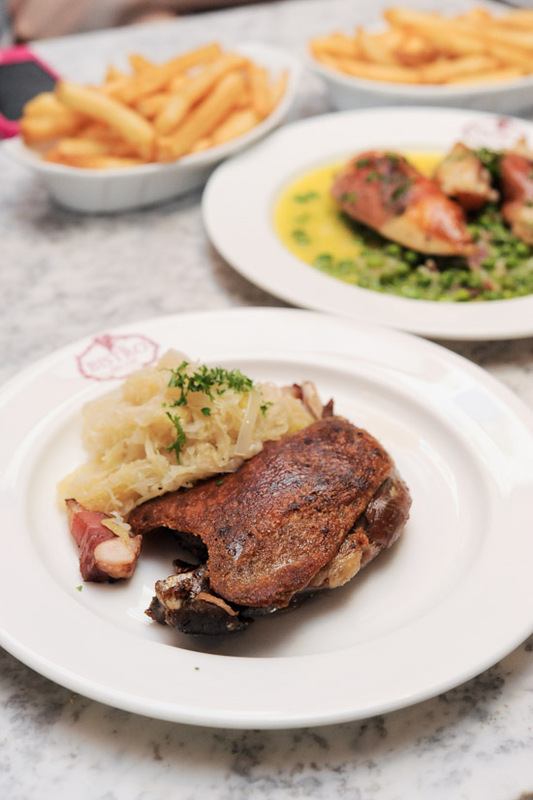 Delectable French food at affordable prices and a casual, non-intimidating laid-back vibe makes Bistro du Vin one of my fave haunts and the duck confit is up there with another favorite, Pamplemmousse @Dempsey. I do wonder how they manage with that miniscule kitchen though, or are some of the food cooked next door @ sister restaurant Les Amis? I went there with my mom less than a week back…wanted to eat the scrambled eggs le..but by then the menu had changed liao…sad…BUT…my mom’s order of foir gras was HUGE!!!! !…we were the 2nd bunch of customers but the first to have the food served to us…the goose liver was FANTASTIC and DAMN BIG lo..(when i peeped at other’s who ate their order later it shrank by QUITE abit)..XD I had duck leg…falling off the bone and my mom had pork belly and shoulder…appetisers i had escargot in leek and potato soup and mum had the heavenly foie gras..XD…Dessert was chestnut cake with ice cream and fresh fruit gratin with coconut sorbet..